How Do End Users Monitor Surveillance? How actively are surveillance systems monitored? Do end users prefer to passively use surveillance for recording activity, or do they actively monitor surveillance video so they can respond in real time? We asked a group of globally distributed end users how they use their system. The charts below take two slices of our results based on system size. We contrast the 'mega' end users with many cameras versus 'smaller', more typical deployments, with less than 100 cameras. These results should not be surprising given that organization with larger systems are presumed to have larger operating budgets and greater monitoring resources. Large surveillance systems are freqently accompanied by dedicated staff that actively monitor them. However, as the camera counts trend smaller, so does the propensity to monitor video surveillance in real time. 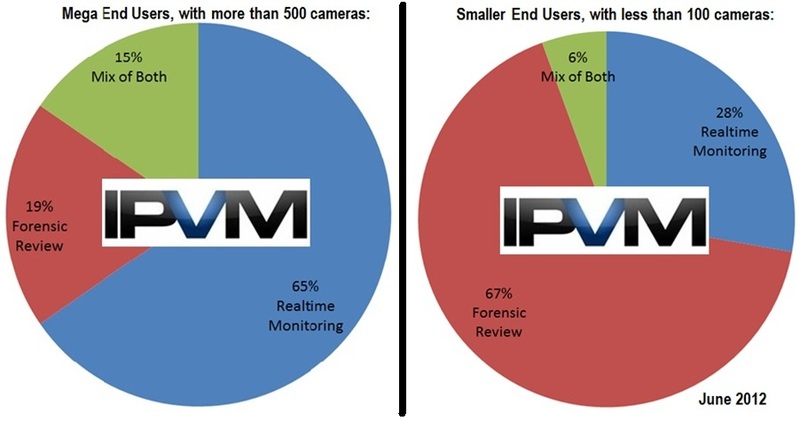 We suspect that for end user deployments with 20 cameras or less, this trend would continue with nearly all responses indicating they view video forensically only. "We couldn't justify the cost of paying somebody to sit and view cameras all day." "We don't have the funds for someone to constantly monitor it." "Due to staffing levels, I can not afford to dedicate one officer to monitor surveillance." "Staffing is clearly an issue." "Cannot afford to post men only to monitor." "We don't have the manpower to watch the system live"
"I have 1012 cameras. I have one student employee for 20 hours a week and myself." Clearly, most end users feel the greatest value of surveillance is achieved when operators are actively and constantly reviewed. If possible, end users would choose to have an active response to events as they occur rather than passively or forensically review recorded video. "must have it due to business requirements and certain regulations"
"We operate at a tribal casino of sufficient size to require a live staff." "Required by MICS and law. Class III gaming facilities must have Surveillance observers watching cameras 7/24/365." Monitoring by Committee: To a lesser extent, end users split monitoring duties between security and some other department. These answers also indicated that surveillance is not always relegated to only 'security' duty, but also sometimes provides 'operations' or 'facilities' with surveillance ability as well. "We use both models based on volume of activity and risk level of location." "IT compliments Public Safety and provides assistance with investigations"
"We have some staff that when time permits, looks at video. IT maintains." "Security Team views sometimes, Process Operations at other times." "Proactive monitoring as far as possible. Also reactive team to remove and process incident footage." "Facilities group and Dispatch proactively monitor." "The mix of both allows us the versatility to address a wide variety of business needs while keeping costs low." Interestingly, this 'mixed user' model was cited more frequently in larger systems. Larger systems correspond to larger labor pools, and even if security lacks man hours to contribute to active monitoring, other departments may contribute labor to the effort. Another characteristic of smaller camera deployments are their tendency to deploy cameras only in 'security critical' areas, while larger systems are more likely to be scaled in supporting other departments.